If you have been following the posts here over the last ten days or so, you know I have been on a quest. For almost forty years, I have been growing rhododendrons in the garden. You might call me a rhodie aficionado. I have gotten to know this "king of shrubs" pretty well. 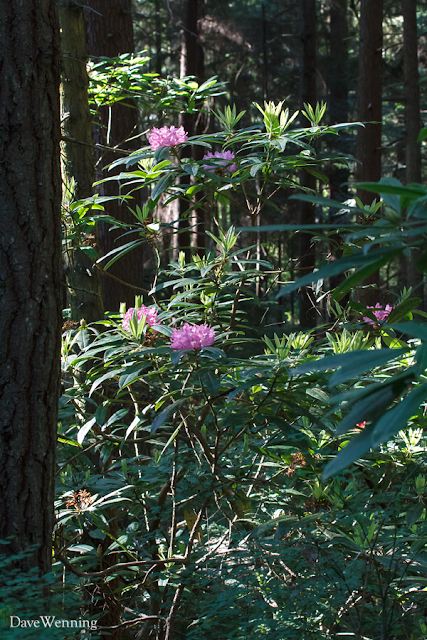 But in all those years, I had never seen our native Pacific Rhododendron (R. macrophyllum) growing in the wild. Thanks to a little help from some friends at Washington State Parks, I found this grove in the Goose Rock forest in Deception Pass State Park. It is located about midway along the Lower Forest Trail. On my first visit, I spotted some flower buds just starting to open. I have been returning at regular intervals to check on the progress of the blossoms. 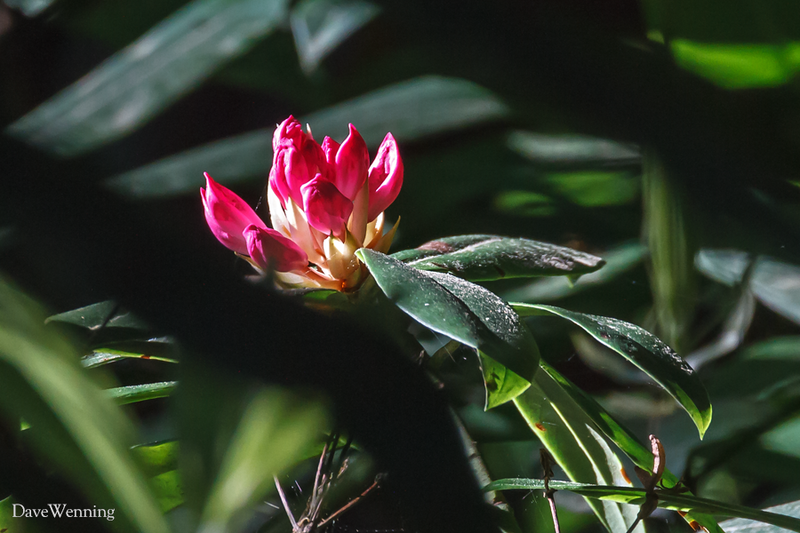 I was back in the grove again this morning, and this time I was rewarded with a single shrub in full bloom. This kind of floral display is unexpected deep in the forest. At the same time, I am amazed how beautifully these shrubs fit into the understory here. Rhododendron gardeners should take note of this habitat when creating their own gardens. 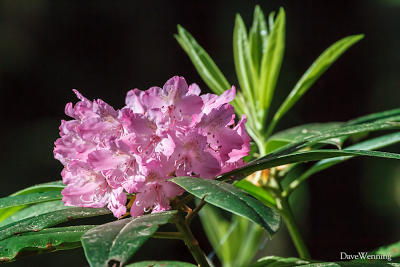 The Pacific or Coast Rhododendron is the Washington State Flower. It was chosen so that it could be entered in a floral exhibit at the 1893 Chicago World's Fair. It was officially designated by the State Legislature in 1959. The Pacific Northwest is a world center of rhododendron horticulture. Our soil and mild climate west of the Cascades provide the ideal requirements for growing these beautiful shrubs. It has been my experience, however, that the native species does not adapt well to garden conditions. They are acutely and fatally susceptible to Root Weevil attacks. They are also rarely available in garden centers and should never be dug up in the wild. It is a beautiful flower and well chosen to represent the state. But it is also somewhat rare here. 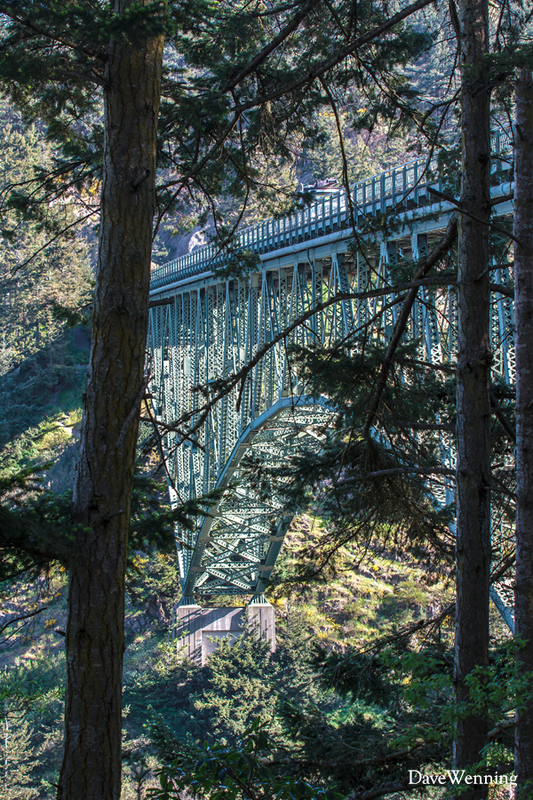 Besides Deception Pass State Park, it can be found growing in Olympic National Park and in a few spots on the western slopes of the Cascades of Washington, Oregon, British Columbia and northern California. I feel privileged to find them so close to home. Click on the photos to view them full size. Notice the Bumble Bee visiting the flower in the photo above. 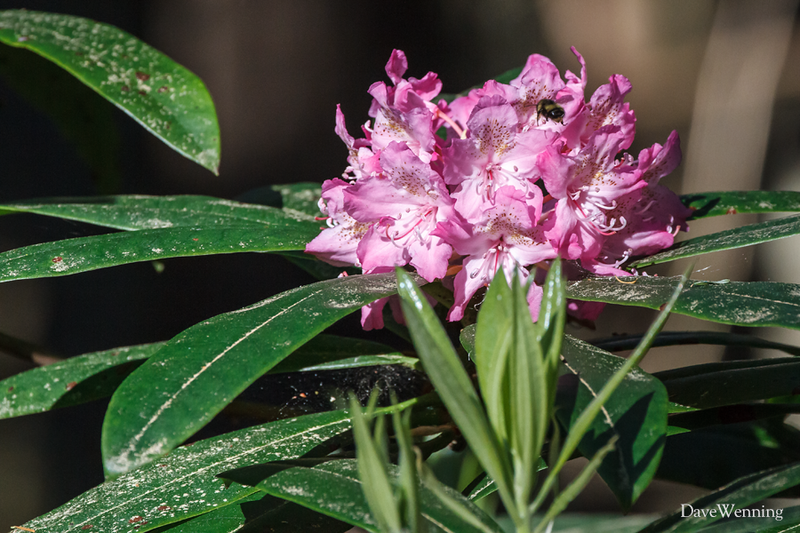 These pollinators will help assure the future of rhododendrons in this grove. I noticed something interesting during this morning's visit. 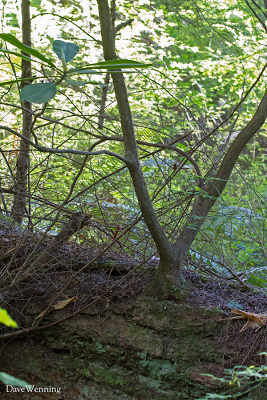 The V-shaped branches in this photo belong to a rhododendron growing out of a dead, fallen Douglas Fir trunk. These so-called "nurse logs" typically are host to a number of Pacific Northwest plants, trees and shrubs. The Western Hemlock (Tsuga heterophylla), in particular, is associated with nurse logs. Where soil is poor and sunlight rare beneath the canopy, nurse logs help to sustain the life of the forest. 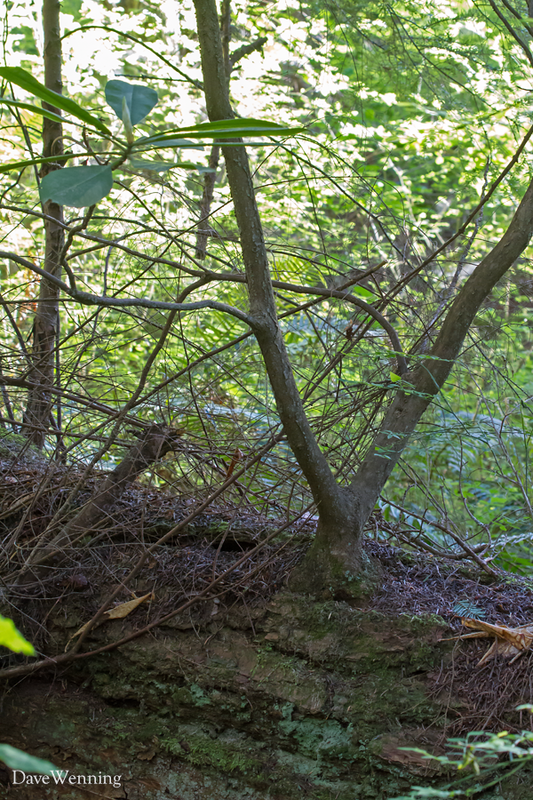 While exploring these woods, notice the variety of plants growing from the decaying trunks of fallen trees. On my first visit, I counted a total of five buds that would open into blossoms. This morning I found a sixth opening later than the others. You can see the speck of red in the lower right quadrant of the first photo. I managed to aim my telephoto lens through branches and leaves to get this shot. Even the immature blossoms are beautiful. 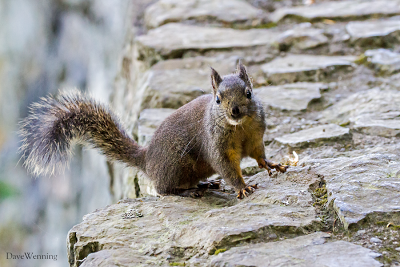 On my return to the Deception Pass bridge, I was greeted by this fellow, a Douglas Squirrel. This is the native squirrel of Pacific Northwest coniferous forests. These are noisy little guys, usually intolerant of trespassers in their territory. This one, however, seemed unconcerned by my presence. Like so many things around here, (e.g. Douglas Fir), he is named after the naturalist David Douglas who explored the region in the early 1800's. 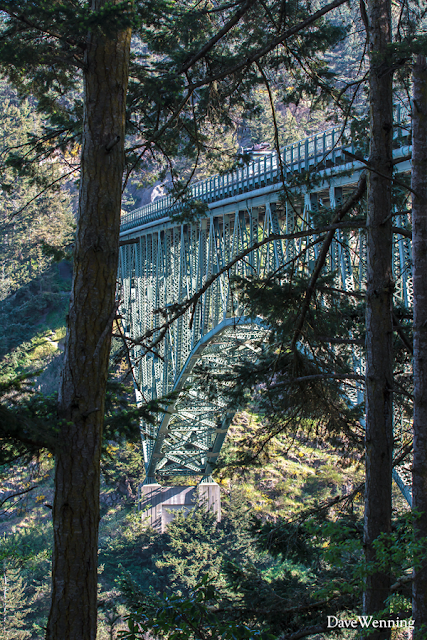 The Deception Pass Bridge can be seen through the trees along the North Beach Trail. Now that my wild rhododendron adventure has concluded, the bridge will take me home to South Fidalgo Island. Then I can start planning next year's visits to the Goose Rock rhododendron grove. Wonderful! Boy you're fortunate to live so close to that wonderful place. I think I've seen numerous wild rhodies growing in the Cascades over the years - I recall they were light purple. Assume you would have encountered them also in your years hiking the region? I do miss the Rhodies here on this side of the cascades. There are some wild ones growing up in manning park just east of Hope. What a display to see them growing wild in the forest. Happy Spring to you. One of the thrills of my life was to find Rhodies in the woods. Beautiful! My daughter lives on Whidbey Island. We love to visit her.